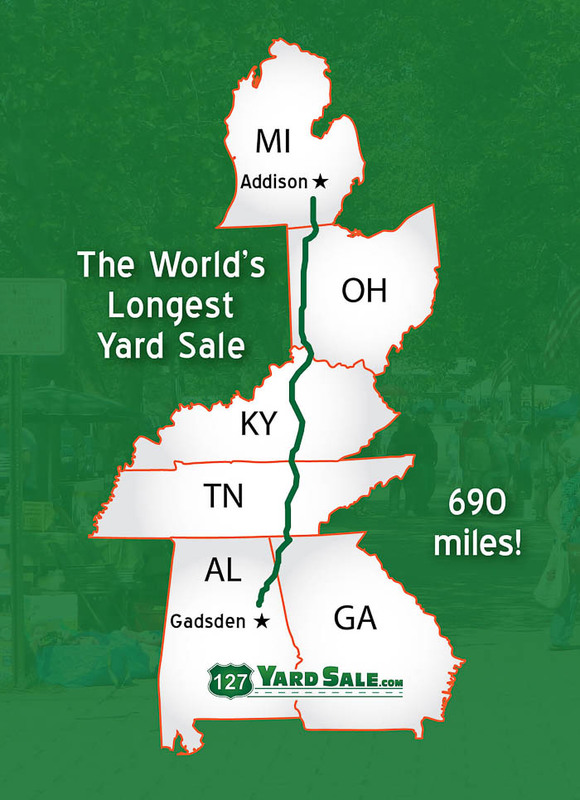 The 127 Yard Sale is the world’s longest yard sale. It typically runs the first Thursday – Sunday of August every year and stretches all the way from Alabama to Michigan. You can find some real treasures and great deals along the yard sale route! Below you’ll find basic information and my best tips for shopping the yard sale! If you live in a town that the world’s longest yard sale passes through, then you might have a love-hate relationship with the yard sale. I grew up in a small town along the yard sale route and that was sometimes the case for me. I absolutely love yard sales, but the traffic that comes with the 127 yard sale is unreal sometimes. Furthermore, it’s like everyone forgets how to use a turn signal and the car in front of you may slam on their brakes at any given moment because they spotted a woven turkey basket to add to their collection. All that being said, I was totally one of those people who was driving slow, failing to use my blinker and slamming on my brakes last Saturday. All in the name of yard saleing. I’ve also seen the yard sale go through phases. My earlier memories of it was it being true yard sales. It progressed to where lots of antique vendors came and sat up and you could hardly find a good deal at all. Slowly, I’ve started seeing more of those true yard sales again and more good deals. And that makes me very happy. Last Saturday, myself and four of my friends loaded up and did a leg of the world’s longest yard sale. We had such a great time and found so many great deals. 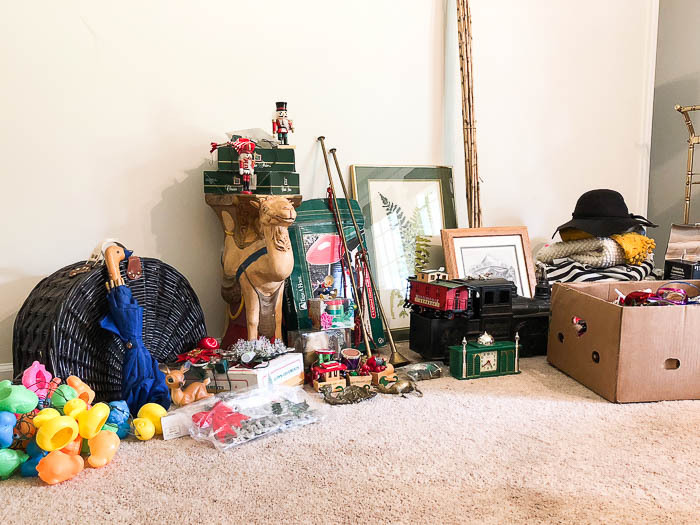 In case you aren’t familiar with the yard sale, I wanted to write a post about it and give you some tips for shopping it in case you decide to find some treasures for yourself next year during the sale. When is the World’s Longest Yard Sale? The 127 yard sale is typically the first Thursday – Sunday in August every year. However, the yard sale used to run for a full week back in the day and some people still abide by that timeline. The Circus and I were shopping the yard sales the Saturday before the Thursday that the yard sales were officially supposed to begin this year. The official dates for the 2019 longest yard sale are August 1st-4th. So go ahead and mark your calendars. Where does the World’s Longest Yard Sale Start? Well that depends. 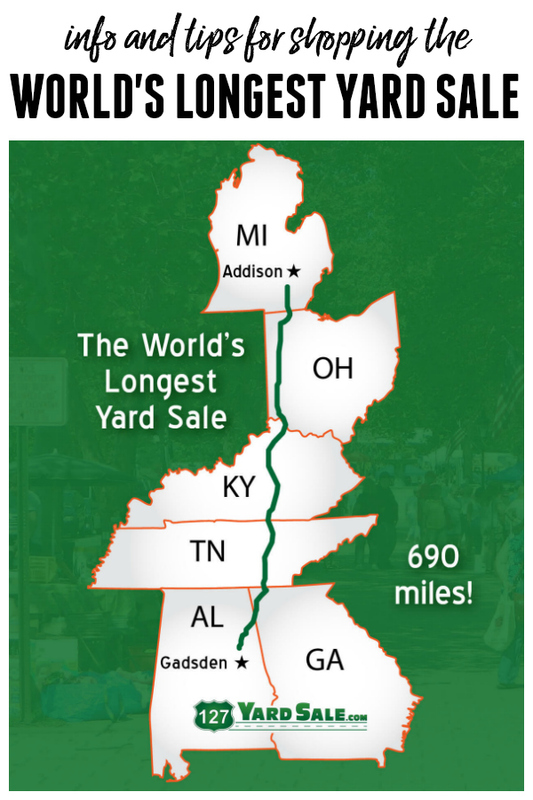 The longest yard sale runs all the way from Gadsden, Alabama to Addison, Michigan. Technically, it starts at either end and you can work your way from one end to the other if you so wish. From where it begins in Michigan all the way to Chattanooga, Tennessee, the yard sale follows Highway 127. Highway 127 ends in Chattanooga, but the yard sale picks back up again along the Lookout Mountain Parkway in Lookout Mountain, Georgia into Alabama. I have never completely went from one end to the other. The farthest I’ve ever been was from Dunlap, Tennessee to the Kentucky line one year. This year, I did some shopping in Dunlap, Pikeville and then all along the Lookout Mountain Parkway leg of the sale. Go with friends and/or family. First off, anything like this is a hell of a lot more fun with friends. I went with four other friends this past weekend and we had an absolute ball. Besides laughing at a few questionable items we saw for sale, going with friends is also great because sometimes they might spot something you didn’t that they know you’ll love. Plus, there are some places along the route where you’re in the middle of nowhere – it’s always best to have a buddy when Deliverance could be just one wrong turn away. My great uncle and I went one year – the year I made it to Kentucky. That was during the time when there seemed to be antique dealers at every turn. 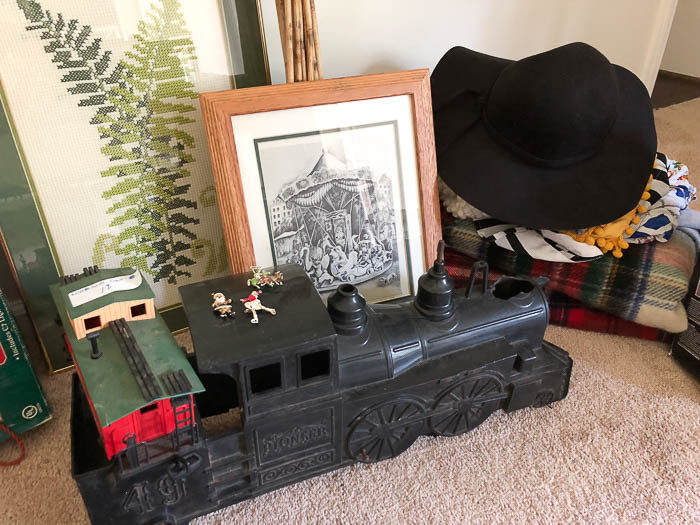 I bought one single item during that trip, but it’s still one of my most favorite yard sale trips because as we were walking through all the sales, my uncle would point out all these things that he remembered having around his house when he was growing up. Take multiple vehicles and fuel up. This past trip, our posse had one SUV and one truck. The truck bed of course held any larger furniture pieces that we found and the SUV held the smalls. Also, if you see you’re getting down to a 1/4 of a tank of gas or so, go on and fuel up at the next gas station you see. There are some stretches where there isn’t a service station for quite a while. A lot of this is up to you. Before you go, decide where on the route you want to start and what direction you’re going to go in. If you really want to do the entire thing, then you’re going to want to take off work for at least 3-5 days, I think. It kind of depends on how often you stop at sales. Most of the sales will be open by about 8am each morning. Closing times vary – I saw some people closing up shop around 4pm, but have shopped at some until around 6pm. If you are making this a multi-day event, you’ll need to also book hotels. Since I have always lived so close to the sale, I’ve never made it an overnight trip. While I’m sure if you are purchasing a big ticket item from a person who is more of an antique vendor you could use a credit card, but for the most part, you’re going to want to have cash. Have plenty of ones, a few dollars in quarters and of course, fives, tens and twenties are good too. I was actually quite surprised by how few people selling had change – I thought that was yard saleing 101. There were a few times this worked in my favor though – I handed them a $5 bill for a $1 item, but since they didn’t have change, they took the $0.50 I offered them instead. Take some of those reusable grocery bags you have at home or boxes and set them up in your trunk or hatch or whatever. As you buy items, put them in your bag or box. If each person in your crew has their own container of some sort, then this will make dividing things up easier when you’re done. You may also want to throw in a little newspaper or bubble wrap in case you need to wrap up breakables that you purchase. Seriously y’all. This is not the time to be cute – especially if your spending a good portion of your time during the sale on the more southern routes. It’s the first weekend of August in the South – we’ve bypassed “hot” and went to just a few degrees below hell. Put on comfortable, breathable clothes. I wore my shortalls with a t-shirt underneath. I opted for the shortalls, because like regular overalls, there are plenty of pockets where I can carry my wallet, keys and phone and not have to lug around my entire purse. If you have to carry a purse, opt for a small lightweight one that you can sling across your body. I also suggest tennis shoes or some kind of comfortable shoes that are closed toe. You’re going to be walking through lots of yards and some fields. There might be holes here and there. You want comfortable shoes. Additionally, in the mornings or if it rains, these places will be wet – you don’t want wet feet all day, thus why I also suggest closed toe shoes. If you’ve got rain boots, throw those in the car if you want to. Again, it’s August in the south. Drink plenty of water, people. If you’ve got room, pack a cooler with iced down water. However, if you don’t want to take up valuable potential space for all the treasures you’ll find, people are always selling drinks all over the yard sales for usually $1 or less. Our group consists of deal finders. We are all cheap. The thing with the 127 yard sale (as I said above) is that there are lots of people who are more antique/vintage dealers that will rent a space for the sale and set up shop. These people tend to be selling their items at prices you would see at your local antique store. Those aren’t the kind of prices we are looking for at yard sales. There are some people who do the 127 sale looking for those kinds of things and will pay those prices. We don’t. We believe yard sales should have yard sale prices. And as my friend Ashely put it, “We don’t care what it sells for on eBay.” Lord, I can’t tell you how many times I overheard some vendor saying that to people. If we wanted to shop on eBay or at an antique store, then we would! We’re yard saleing for a reason, dammit. I was in the lead with the truck and the SUV behind me. Jason rode with me and was the lookout. As we would approach sales, I would slow down and he would look to see if he thought it was worth us stopping at. Stop at those church sales. God bless all the little old church ladies who donate their time and unwanted items to church sales. They tend to have really good stuff at really good prices. They are also just as sweet as can be. Don’t discount the yard sales off the main route. Somewhere along the way, you’re going to see signs pointing off the main route to yard sales. These can be hit or miss. More often than not, I’m probably going to check them out because there are going to be a lot of people who don’t want to get off the main route, so there might be a few gems there just waiting for me. A barn or building full of stuff isn’t always great. You’ll see a lot of yard sales where they have an entire building or barn with stuff in it for sale. In our experience, this stuff was all overpriced. If there’s a field full of people set up, then prices probably aren’t that great. There are lots of property owners along the yard sale route that will rent out their land to vendors during the sale. You’ll see quite a few really large areas just covered with vendors. In my experience, those people are typically more overpriced. If you see maybe 2-5 people set up selling somewhere though, you might find a good deal there. For the most part though, we found the best prices at family yard sales along the way. Don’t forget that you can offer less than what they are asking. This is especially true at the end of the day on Saturday and on Sunday. Toward the end of the day on Saturday, we ran into quite a few people who were packing it up or told us that would be their last day. They were very much ready to make a deal so they didn’t have to take it all with them. This is even more so the case on Sunday since it is the final official day of the yard sale. Enjoy the scenery and atmosphere. One of my best friends, Jason, rode with me this past weekend when we hit up the sale and we both really enjoyed the scenery along the route. 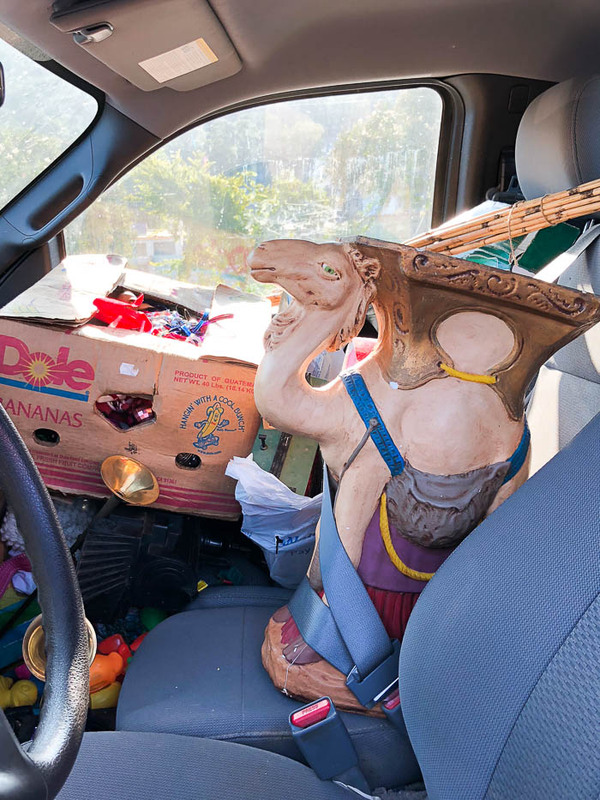 We both agreed that if you wanted to see parts of the real south – not the big cities, but small southern towns, that the longest yard sale was definitely a way to do it and find some great deals at the same time. Stop at local restaurants to eat – skip the chains! We had lunch at a little BBQ place and it was some of the best BBQ I’ve had. And now for what you’ve really been wanting to know – What did I get at the yard sale? 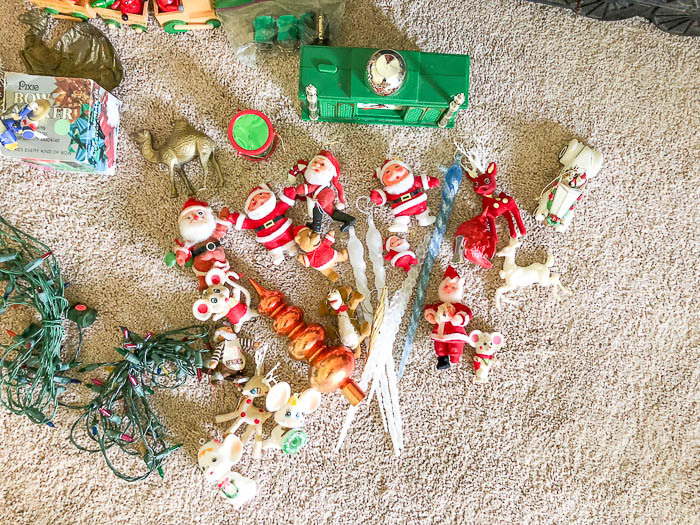 Countless Christmas decorations include vintage Santas, nutcrackers, vintage Christmas signs, outdoor lights, basic ornaments, a bow maker, lights, two brass horns and more. Umbrella with a Wooden Duck Head Handle – I’m a sucker for old umbrellas with adorable handles! I did a Facebook live on Sunday going through everything I bought, if you didn’t catch it, you can watch it here! The Circus and I did do a few of the 127 yard sales the weekend before and there were a few other things I got then too that aren’t pictured here. I think that day I spent about $30 or so. Have you shopped the 127 Yard Sale before? Don’t forget to mark your calendars for next year! Also, you can find more information and resources about the longest yard sale on 127yardsale.com! Most importantly – strap those treasures in on your way back…. Couldn’t risk breaking that camel! Thanks for this post! I did the Chattanooga/Signal Mountain part over the weekend and yep, those fields of vendors were NOT what I wanted! I’ve been looking for tips and this helps!! Yea, Signal Mountain is filled with tons of antique vendors – drives me insane! Definitely try the Lookout leg next year!! OMG – this makes me so happy to hear this!!! I almost thought about NOT going next year, but now I am excited!! Go, girl! That leg is by far the best I’ve ever been on! 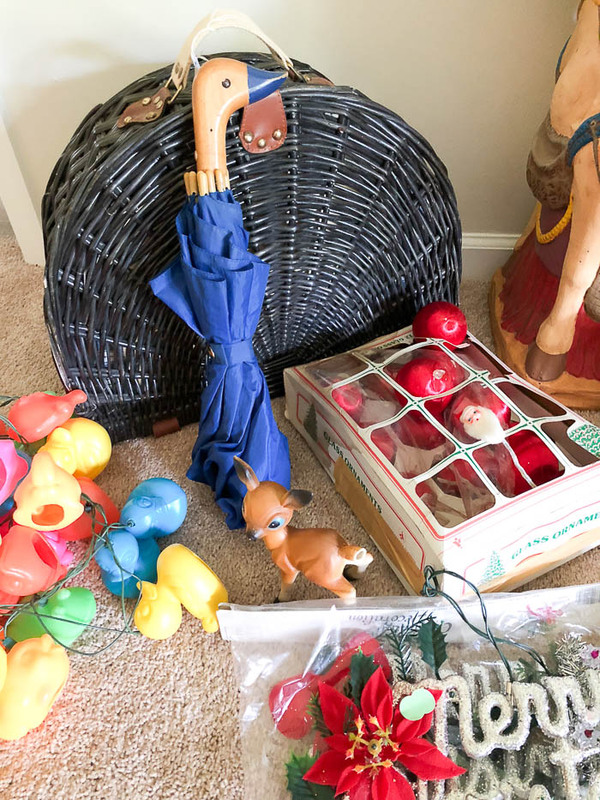 As for your finds, I love the picnic basket, vintage Christmas decorations and the duck handle umbrella and that camel side table is so campy and hilarious! Have a wonderful day doing tie-dye with the Circus! You guys are totally my girlfriends with a few guy friends mixed in! 🙂 And lord, it is hot down here! I am past ready for cooler weather! That camel side table is AWESOME! I’m up in the north (PA) and we have a long-ish yard sale this weekend. Can’t wait. LOVE that camel!! Have fun yard saleing this weekend!!! Hope you find some awesome stuff! Hi, you just postedabout room darkening panels for doors. I cannot access, if you don’t mind sending me where you bought them, it would be greatly appreciated. my girlfriend and I did it this year (2018), tho most of wednesday and thursday were rained out. It was a beautiful 72 degrees out, we did mostly lookout mtn and mentone. This year my husband rented us a cargo van, which was awesome!! I love the camel table and would have tried to outbid you, ha ha! we fpund a great 7ft, metal knigjt and great mid century lamps and lots of dolls for my art projects. Oh wow, what great finds, Carmen!! I bet it was so much fun in that van!! I’m sure we’ll upgrade to something like that at some point! My crew loves junk! haha! Okay, you will love this story…..
My mom and I had always wanted to go to the World’s Longest Yard Sale but never lived close enough. When my parents first moved to Chattanooga, we came down from Chicago to visit. It was the first week of August, and there were all of these tax-free sales etc.. so we decided to beat the chaos of Gunbarrel Road and go up into Signal Mountain to drive around. There were all of these garage sales, and I mentioned that it must be some kind of local event or something. We even stopped at one of the sales and looked around. That night we are at my parents’ house and the news comes on about the Worlds Longest Yard sale and my mom and I looked at each other and laugh. We went to the Worlds Longest Yard Sale without even knowing it. bahahahahahahahaha!!!! Girl, that is hilarious!! And while I don’t “know you, know you” – only virtually – I can totally see you doing that!!!!! Too bad this yard sale is on the opposite side of the country!! Looks like a blast, so I’ll put it on my bucket list…I should be a seller, not a buyer though!! I love finding mom and pop places to eat – the food is always better! Daughter #2 is looking for a house to rent in Georgia as I type this and I’m hoping I can come and visit her there, with a stop in Chattanooga!! 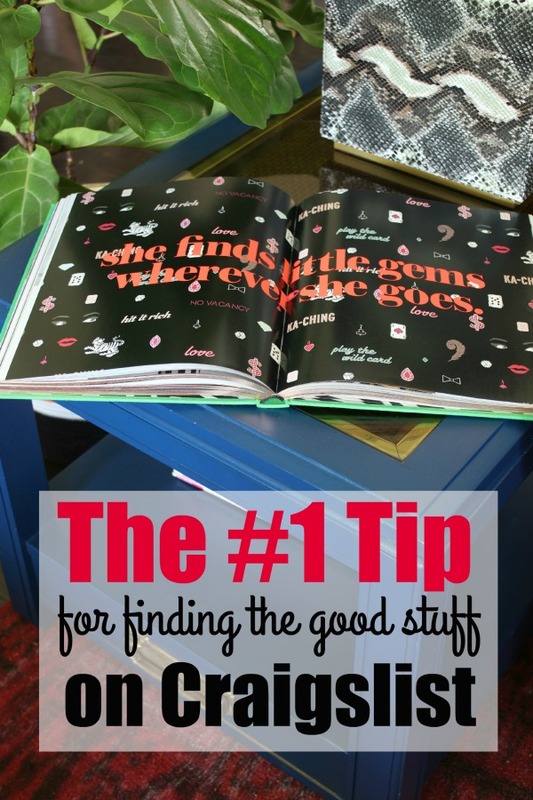 I’ll be looking for your treasures in future posts – can’t wait to see what you do with them! You’ll just have to plan that trip to Georgia right around yard sale time!! 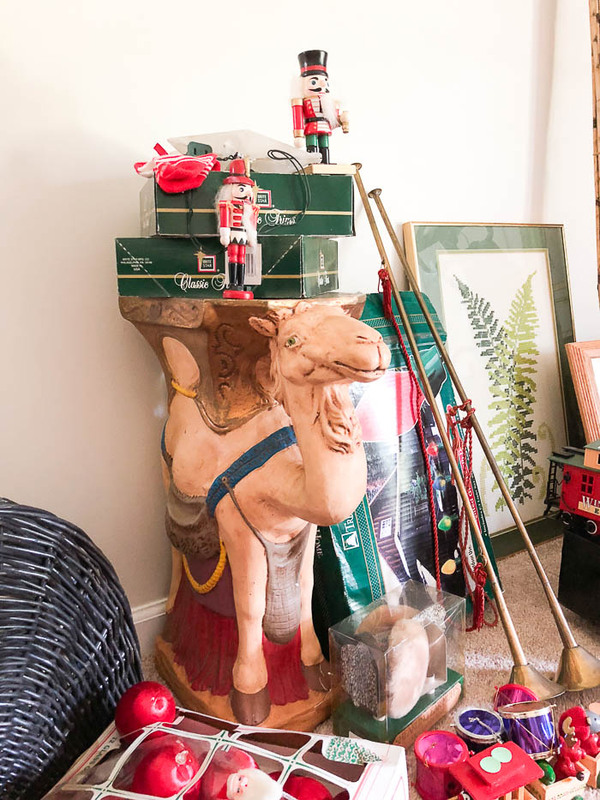 Some great finds- camel, umbrella, and Christmas stuff! Is that a print of a carousal:)? That would be a great adventure! Wish I lived closer. When I lived in Chattanooga I always wanted to do this, but it always happened to fall on a Saturday I had to work. And I worked on Signal Mountain right on 127 so it was like this giant sale was just taunting me 😉 One day I will make it back to that neck of the woods. Thanks for sharing your tips at Merry Monday! Oh you have to come back and do it sometime!! You won’t regret it! Well girl you got me wanting to do this trip. Have always wanted to go but never have. Go to see a post again. I love a good yard sale. The camel is my favorite. I wished I lived closer. Thanks for sharing on Sunday’s Best. You got some great stuff!! I so want to go to this one year. I am in Charlotte NC so it would be quite a drive. Still it’s one of my goals! Very jealous, love that camel! Lol! Make it a fun girls trip, Kim! You won’t regret it! Oh, it sounds so fun! I wish I didn’t live so far away!! Thanks for sharing your great tips with SYC. It’s a ball of fun, Jann! You’ll have to make the trip sometime! I LOVE vintage Christmas stuff! What GREAT finds, Jenna….just awesome! Thanks, Brigitte! 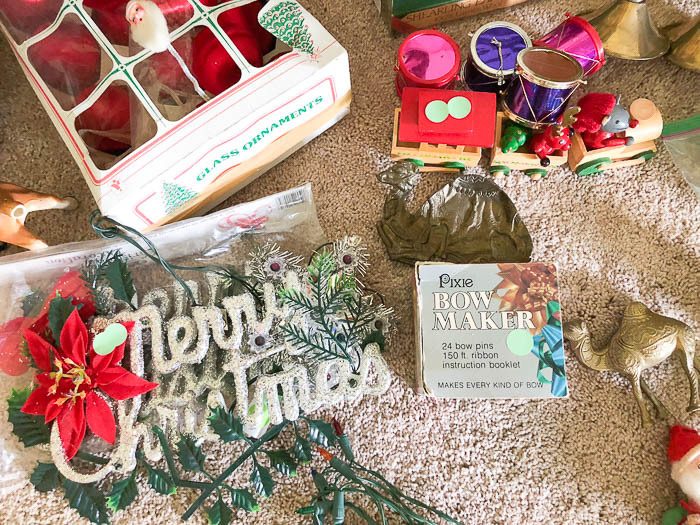 Me too – I cannot help myself when it comes to vintage Christmas things!!! Ah! I had the same umbrella when I was kid, it was yellow. My grandma gave it to me and I thought it was the coolest. We have looked to get one for my daughter with no luck. So cool!! Oh that’s so sweet, Megan! Well I’m going to be on the lookout for a yellow one now as well and if I ever come across one, it’s yours! I know how meaningful things like that are!